Amazon Echo - What it is; what it will be. Amazon’s surprise announcement. CLASSIC Apple. Surprise announcement from Amazon today. They somehow managed to keep this thing under the radar up to now, a feat Apple hasn’t been able to pull off for a while. As tech bloggers like to say, Amazon continues to out-Apple Apple. So what is this gizmo? It’s a black cylinder, 9″ tall by 3″ wide, with a light ring/volume knob, a couple buttons, and a bunch of microphones, plus a whole lotta holes for the hidden speakers. I see this as Amazon’s first step at becoming a central figure in your home that everyone interacts with, like what the X-box has become. It’s a shared device for the whole family, and their conduit to the Amazon ecosystem (and another reason to pay for Prime). I bet you there are internal Amazon presentations that show pictures of a proposed Echo home five years from now, where each room has an Echo posted in there. There are limitless possibilities if it works seamlessly. Amazon wants to get another foot in your door, and a wireless speaker that does more than wireless speakering is a smart way to begin, just as the X-box was never intended to be only a game console. The question is, will people really use it for all of this, or will it go the way of Siri for most people—a novelty for the first week or two, something to show off to friends, but then, enh, it’s simpler just to do it on my phone. I don’t think people mind being on their phones so much these days. But get folks used to talking to a device… “Alexa play Christmas music,” and “Alexa, turn it down a little,” and suddenly we’re using it for a few more things each month. Like ordering groceries from Amazon. Replacement batteries from Amazon. Another Echo from Amazon. ANOTHER ECHO FROM AMAZON. Okay, yeah, it’s really not that scary. You’ll get one or you won’t. You’ll use all it’s features or you won’t. UPDATE 1/6/15: The Amazon Echo release date to the general public has finally been set. February 15 is the day, and it’ll cost you $199 (UPDATE: only if you don’t have prime. Prime members will only pay $99 at release). 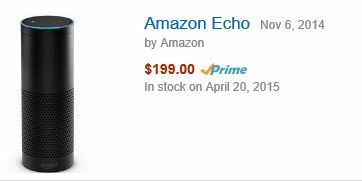 Everyone who Amazon invited to receive a pre-release version of Echo (at $99) has already gotten theirs, (UPDATE: Not true! See below!) and the reviews have been mostly positive. Tagged: amazon announcement, amazon echo, amazon echo release date, amazon echo release date announced, gadgets, tech, What is Amazon Echo? Dedicated to composing only the highest quality nonsense.